We put our new van through its first real road trip this week. We packed a few movies, plus the audiobook version of Harry Potter and the Chamber of Secrets, and finally we purchased two copies of Pokemon Emerald Green for the twins’ GameBoy Advance systems. Combined, these did a pretty reasonable job of occupying the kids enough to make the time in the van bearable. 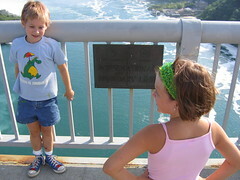 I remember being bored out of my skull on family trips. My kids have no idea how easy they have it! 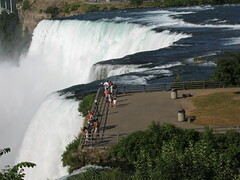 We arrived mid-afternoon, and after checking in to the hotel walked over to view the falls. It was spectacular! 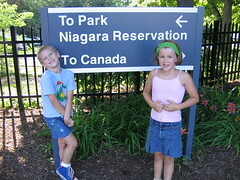 The kids, tired and road weary, were even impressed. 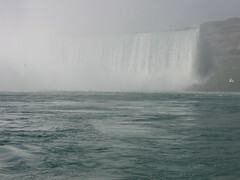 We walked over to the Horseshoe Falls and back, marvelling at the enormity of the falls. We decided to eat dinner in Canada. The girls quite enjoyed the idea of walking to another country. After dinner we retired to the hotel, where the kids exhausted themselves in the pool. 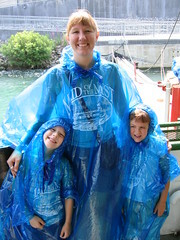 The next morning we decided to ride the Maid of the Mist. The girls were thrilled with the ride, as were Carina and I! From Niagara Falls we drove to Boston, Massachusetts, where we stayed for two nights with Jude and Jenn (thanks!! ), and then three nights in a hotel. 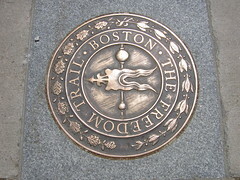 Carina and I were eager to follow the Freedom Trail. 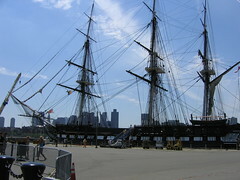 We got to the USS Constitution (Ol’ Ironsides) and spent a little longer there than we had expected. 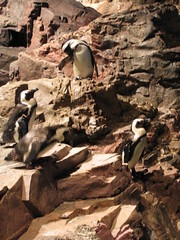 After lunch, the kids were tired and cranky, bored with all the stupid history we were forcing upon them, so we decided to take them to the Boston Aquarium. It was great! 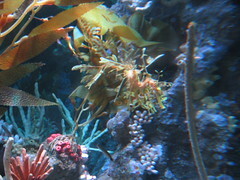 The leafy sea dragon was quite challenging to photograph, as it never quite sat still. 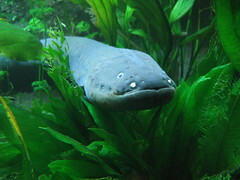 Click the image below for a 30 second AVI video (~9.5 meg) of this wonderful creature. 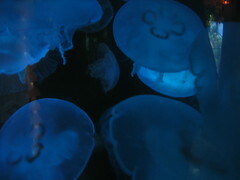 The aquarium also had a spectacular jellyfish display. 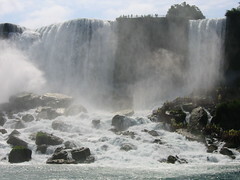 Again, the constant motion made it hard to capture their hypnotic beauty. 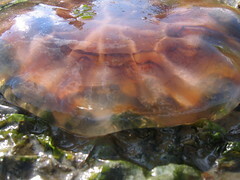 Click the images below for short AVIs of the jellyfish. 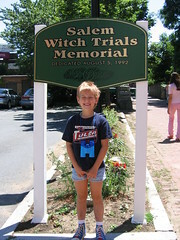 We took a short drive to Salem, hoping to educate the girls a little bit about witches and witchcraft. At eight, their concept of witch largely stems from Disney’s renditions of good and bad witches. We spoke a little bit about the hysteria leading up to the Salem Witch Trials, and then attended one of several Witch Museums. It turned out to be a 30 minute recorded narration while we sat in the middle of several elaborate dioramas. The kids were tremendously disappointed that it wasn’t a proper museum; but I found the presentation to be extremely informative. No one was burned at the stake. Most accused witches were hanged, save one unfortunate fellow who was crushed to death under heavy stones. The proposed explanation for the genesis of the witchcraft hysteria was interesting. Carina’s aunt lives in Berkley, not far from Boston, and we had planned early on to spend time with her. Niklas, Carina’s cousin, and his friend Michael were visiting from Sweden, so it was a real treat to spend the day with them. We took a small boat out, and tried our hand at water skiing. Neither Carina nor I fared very well, to our disappointment. After we got back, and had a quick snack, the kids and I wandered around the shoreline while Carina and her aunt spoke together for some time. 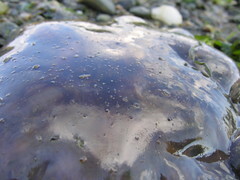 The twins were alternately disgusted by and fascinated with several jellyfish that had washed ahore. With our time in Boston waning, we decided to try whale watching. We arrived at the dock at 9 AM for the 9:30 boat. Almost immediately after setting out, Carina started feeling ill. I’d purchased some Dramamine for her in the ship’s galley, but it wasn’t strong enough to do her much good. 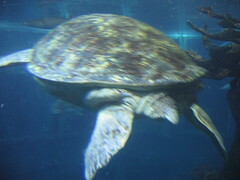 She suffered in discomfort for the hour and a half trip out to Stellwagen Bank. It was worth it, though! We had nine or ten seperate whales around our ship at various times. Most of the sightings were mist from the blowholes, but we were treated to a fair bit of fluke and fin smacking, plus one full breach. 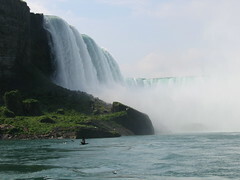 It was breathtaking to see, and a real treat for all of us. I knew that neither my camera nor my reflexes were sufficient to snap any decent photographs, so I took movies, instead. Below are four AVIs you can download. The first is just 30 seconds of ocean as the ship made its way toward the Bank. The remaining three are various whales doing various things. An unfortunate shortcoming of my camera’s design is that it cannot zoom while recording, so all of the images will be pretty small. Finally, the last stop on our trip was Philadelpha, Pennsylvania. Our intention was to try to squeeze as much in as we could; but we were all too tired – and it was way too hot – for that plan. So Carina and I contented ourselves with a brief stroll around Independence Square on Tuesday night. 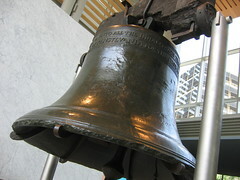 Wednesday morning we got up and took the kids to see the Liberty Bell. They weren’t terribly interested, but they made a decent effort at paying attention as I droned on about the significance of symbols of our freedom. 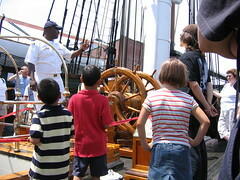 I hadn’t seen the bell since I was probably their age, so it was an educational experience for me, too. I really enjoyed it, and would like to go back to spend a little more time poking around some of the surrounding sites – especially the Mint. We had an uneventful drive home, and we’re all now looking forward to catching up on everything that we missed. It really was a pleasant, relaxing vacation; and I’m really looking forward to travelling with the family again!